Mr. Shewfelt served on Goderich Town Council as Councillor, Reeve and Mayor for more than 28 years, 22 of those years as Mayor. 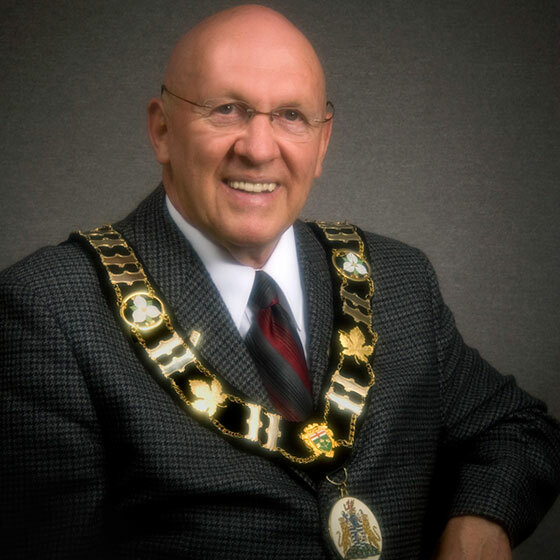 He also served as a Huron County Councillor for four years in the 1970s and from 2000 to 2014, and is a past Warden of Huron County (2007). Prior to his position as Mayor of Goderich, Mr. Shewfelt worked as a real estate broker and land developer. Mr. Shewfelt has served on several boards and committees, including the Mayor’s Committee of the Lake Huron Southeast Shores Initiative, Great Lakes and St. Lawrence Cities Initiative, Maitland Valley Conservation Authority (Chair) and the Joint Management Committee of the Ausable Bayfield Maitland Valley Source Protection Region. He also served on the Advisory Panel of the Ontario Drinking Water Standard of Care Committee and is a past Chair of the Ontario Municipal Water Association. For a lifetime of dedication to municipal service and environmental protection, he received the Queen Elizabeth II Silver Jubilee Medal in 1977 and the Queen Elizabeth II Diamond Jubilee Medal in 2012. In 2015, he was appointed to the board of ONE CARE INC., a not-for-profit health care provider offering home and community support services to citizens of Huron and Perth counties including Meals on Wheels, EasyRide transportation and respite and adult day away programs.